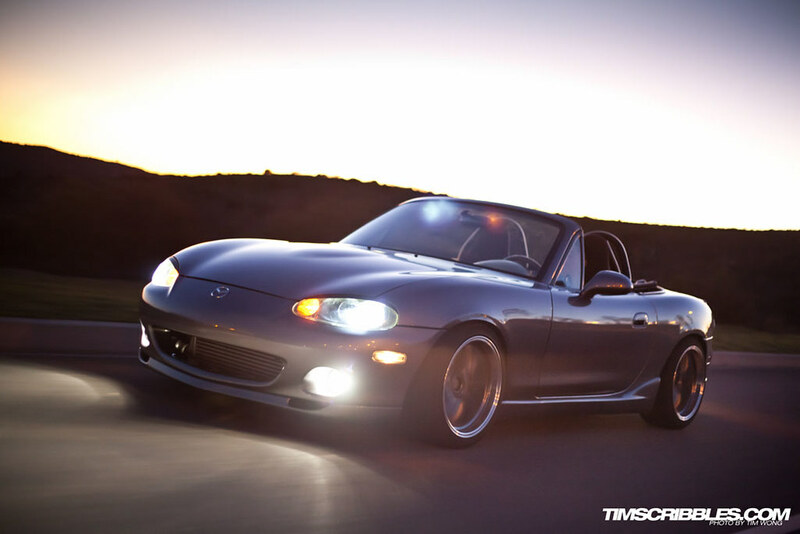 The king of the roadster for over a decade has been the Mazda MX-5 also known as the Miata. This affordable drop top has been a incredible hit due to the light weight, front engine/rear wheel drive, and the simplicity of its design which is a philosophically direct descendant of the small British roadsters. Here in Southern California, the small roadster is popular as ever. 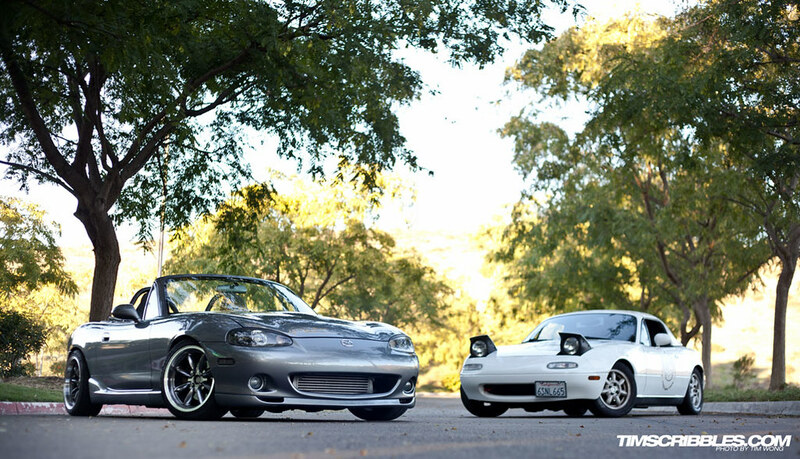 Brian and Micheal are a couple of the enthusiasts that are apart of the Miata scene. 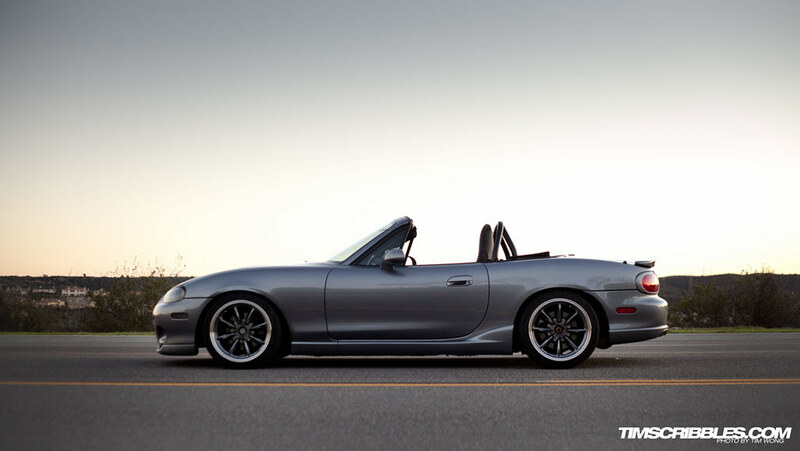 Brian has always been an enthusiast of grand tourers and in 2006, he decided to swap his Nissan 300ZX for a Mazdaspeed Miata(MSM). 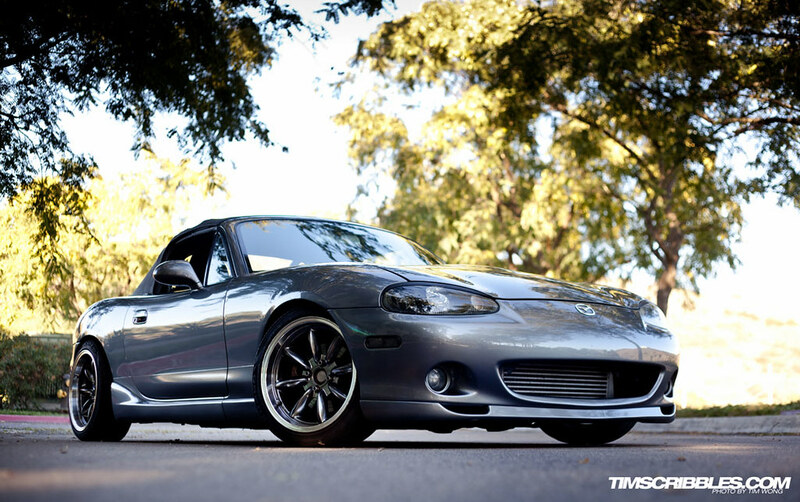 Although the MSM isn’t a common car even in the Miata scene due to the increased price tag, Brian feels the improved factory performance and reliability in mind, minimizes the need for aftermarket parts. 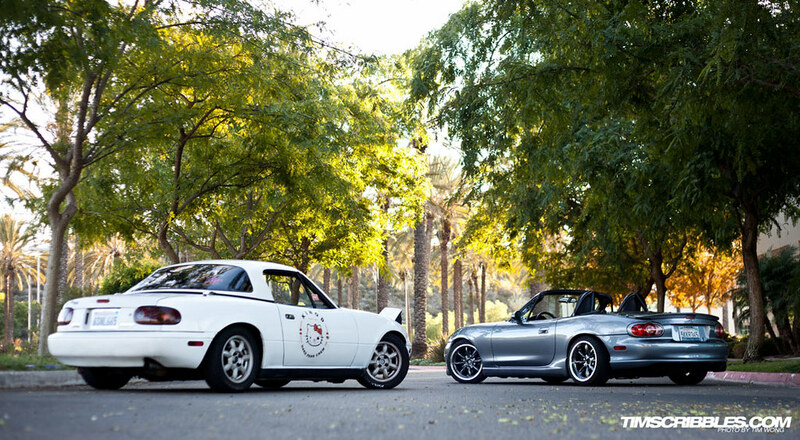 Mazda loves to tag mottos and slogans to their products such as the Zoom-Zoom and the Miata’s Jinba Ittai which means person and horse as one body describing unity of horse and rider to describe a driver’s connection with the car. 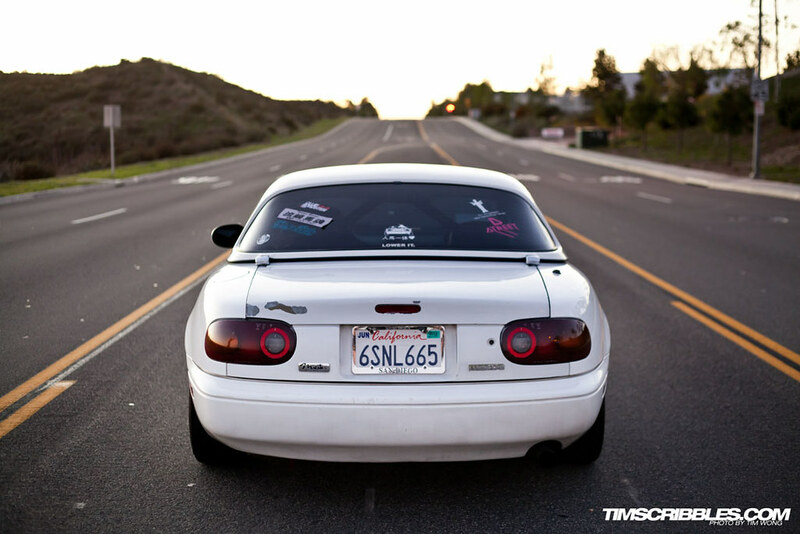 Brian tagged his own motto to his car: beauty from simplicity which he successfully shows from his car. Brian mentality toward modifying his car was to avoid modifications that would engender dramatic changes in drivability. 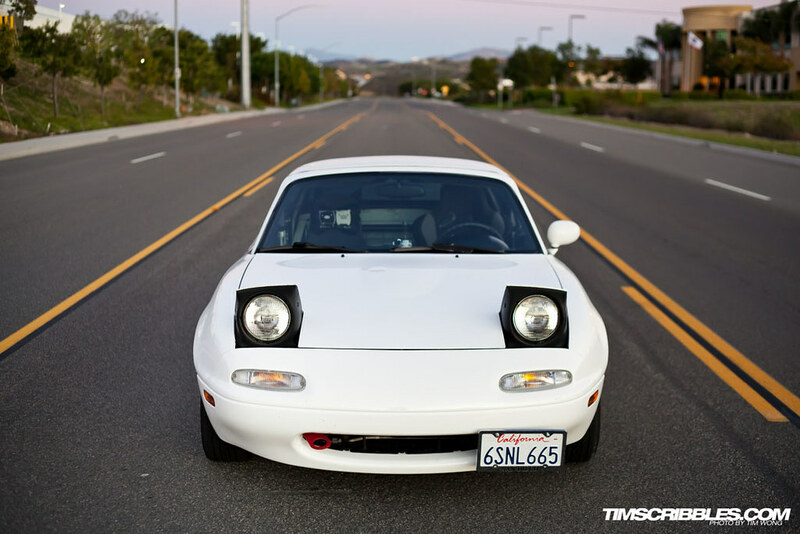 So he added performance parts that would optimize the factory components such as Flyin’ Miata Intake, Flyin’ Miata Full Turbo-back Exhaust, Go Fast Bits Bypass Valve, and CX Racing Intercooler that would maximize the factory turbo. 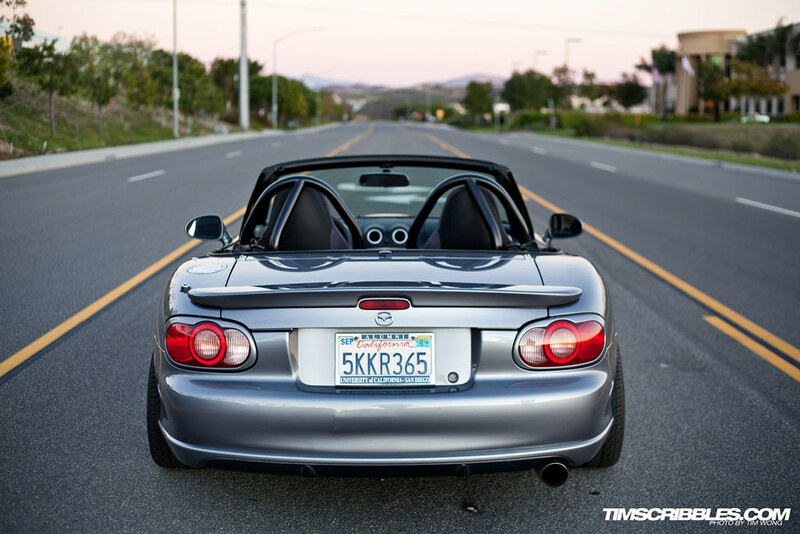 Flyin’ Miata Sway Bars, Boss Frog Frog Arms and Boss Frog Double Hoop Roll Bar were installed to reinforce the convertible chassis. 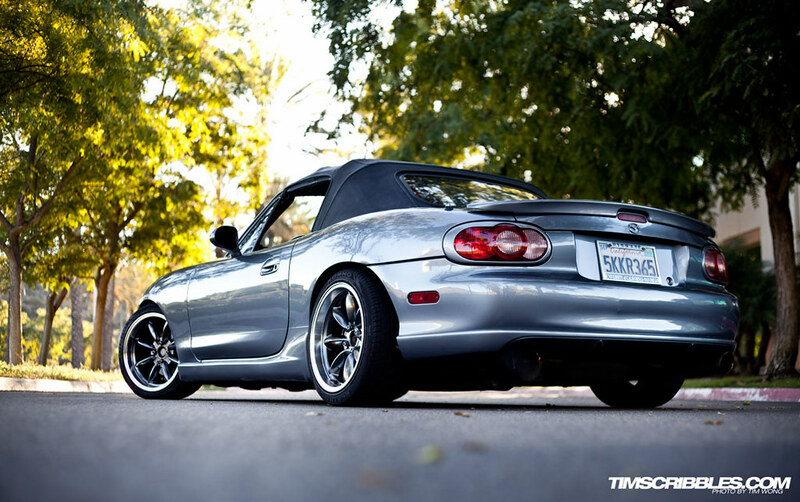 Fat Cat Motorsports Adjustable Perches and H&R Race Springs allow him to retain the Bilstein dampers while giving more appropriate rates and height control. Exterior and interior mods were selected in the same way. Everything, from the dual-hoop rollbar to alcantara wrapped interior elements, strives to maintain a simple, cohesive, and factory-looking visual style. On the outside you see a RS Factory Stage Front Lip and a set of Rota RB-R 16×8 and behind the wheels are some Porterfield R4-S Pads. 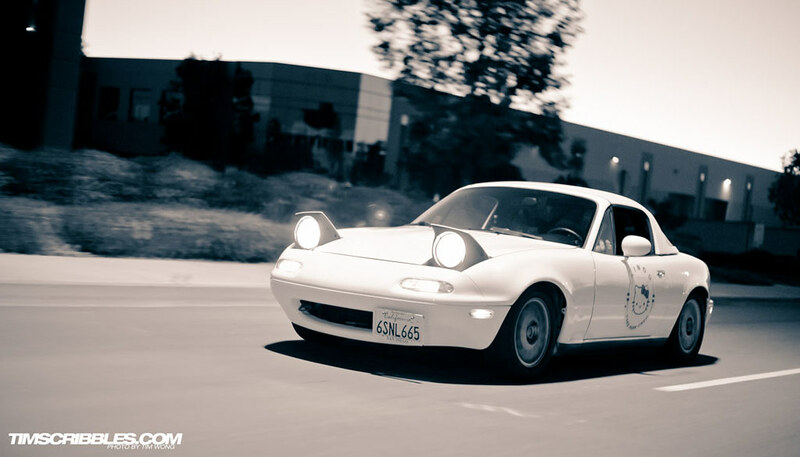 In the future, Brian hopes to acquire another grand tourer to take over daily duties while he saves up for some big plans under the hood of the Miata. 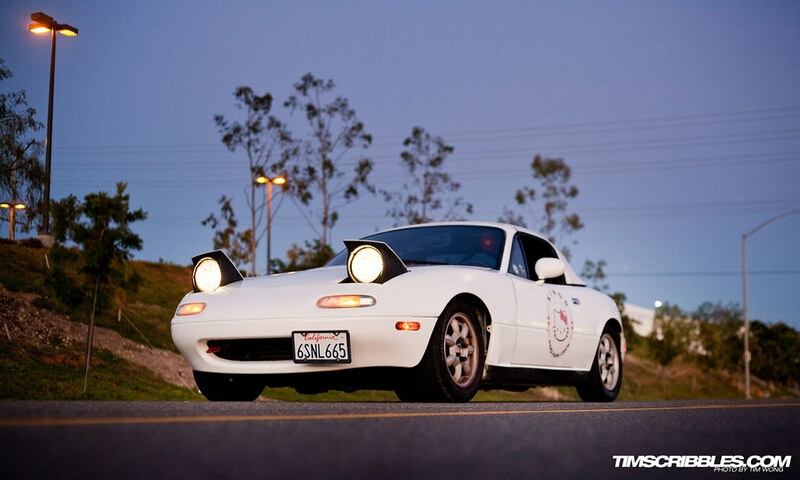 Some of you may have seen the infamous Hello Kitty Miata. Well, it belongs to Michael who picked it up in 2007 for $2000 with 150,000 miles on the clock and now has 227,000 miles. 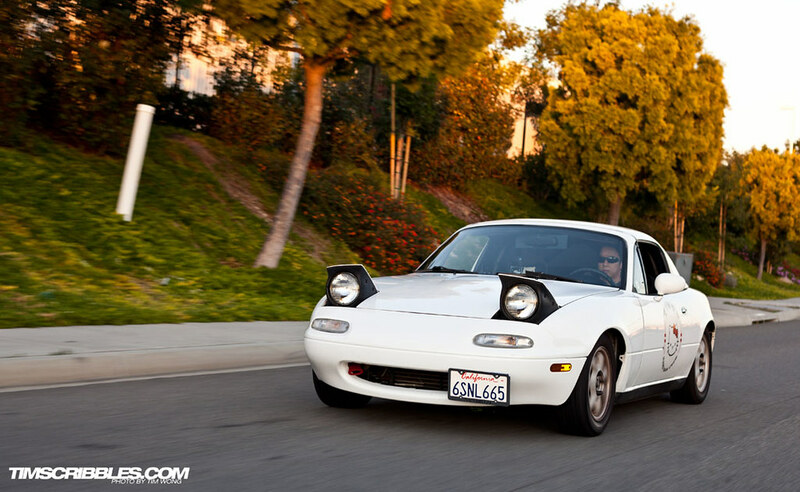 Originally, he was searching for a MX83 Cressida because he had one back in his high school days, but then he encountered Chris Lee’s Miata (http://www.triplezoom.com/news/publish/article_316.shtml) . It was then he just had to get one himself which lead him to find inspiration from the NoPro Miata (http://www.nopro.jp/page/photo/photo.html). What makes the car so appealing to Michael is the light weight, short wheel base, and the rear wheel drive. He also finds the Jinba Ittai motto to hold very true where the car drives and feel like an extension of the driver. 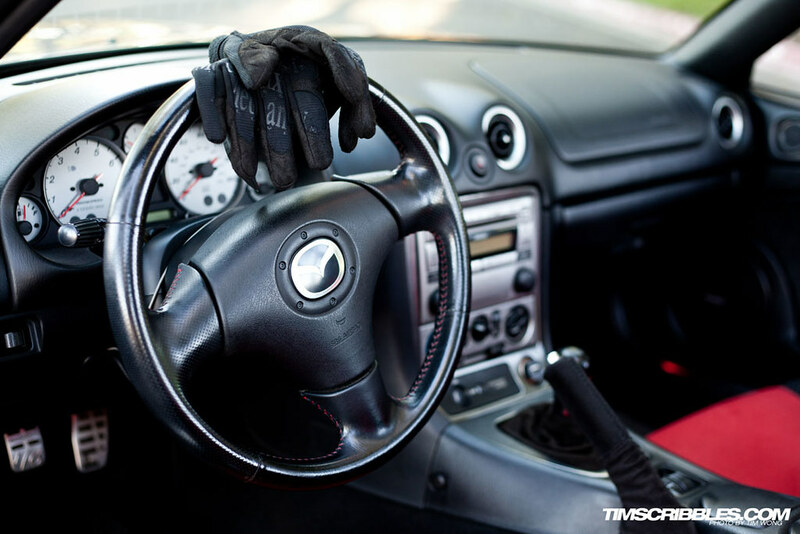 Each and every move made by the drive directly translates to the car which breaks the barrier between of car and driver. 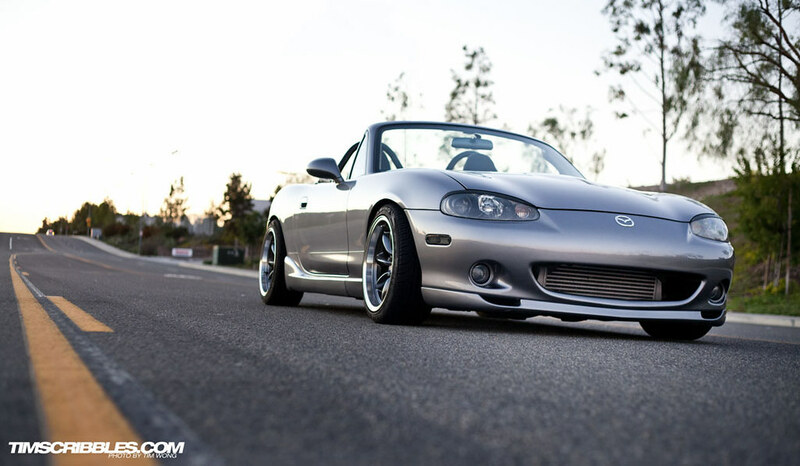 Performance wise, he has a couple simple additions of a K&N Stock Replacement Air Filter and a HKS Header. 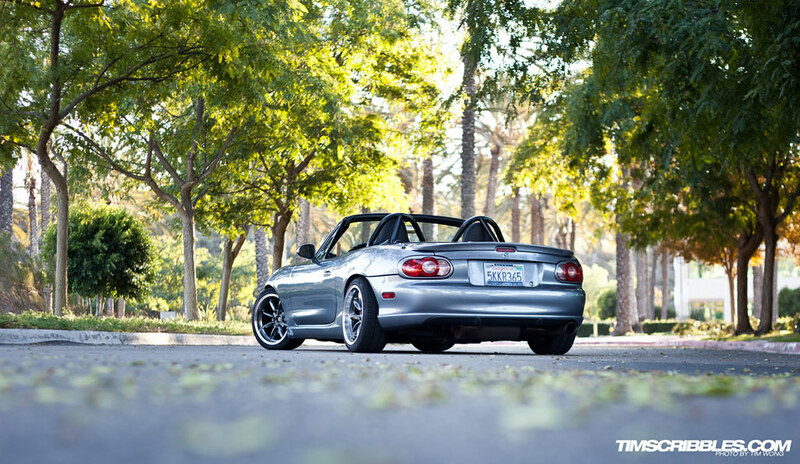 On the exterior, you see it lowered on a set of Tein HA coilovers. He’s also sporting a GarageStar Wiper Cowl and Radiator Cooling Panels. His future plans are to get some new seals so the car stops leaking fluid, new suspension bushings, new tie rod and tie rod ends, new ball joints, and a clutch differential. He plans to drive this car to the ground and even after that, he’s going to pick up another one.